There are a number of options available and each have different types of tax benefits. We encourage you to talk to your professional advisor (i.e. your lawyer, accountant, etc.) if you have one, because while everyone’s needs vary, your advisor can help you decide which options(s) may work best for you and your family. If you do not have or know of an advisor in your area, we will be happy to arrange a meeting with our (legal) advisor at no cost to you. A charitable bequest is simply a distribution from your estate to the Comox Valley Project Watershed Society through your last will and testament. To do this, you must use very specific language to indicate the precise direction of your assets, and to successfully carry out your final wishes. There are various types of bequests to consider. General Bequests are legacies that come from the general value of your estate, and are made by designating a specific dollar amount, a particular asset or a fixed percentage of your estate to the Comox Valley Project Watershed Society. Contingency Bequests allow you to leave a portion of your estate to the Comox Valley Project Watershed Society if your named beneficiary does not survive you. A cash or security gift is an amount made out to the Comox Valley Project Watershed Society. Gifts of cash are available for immediate use in the form of cash, cheque, credit card, or pre-authorized contributions paid monthly. They can also be given in the form of a general bequest in your will and testament. A gift of life insurance is made when you name the Comox Valley Project Watershed Society as the beneficiary. This means that you control the policy, and the Comox Valley Project Watershed Society would receive the insurance proceeds upon your death. Gifts of retirement plans are made when you name the Comox Valley Project Watershed Society as a beneficiary. This means that upon your death Project Watershed would receive the proceeds and your estate will receive a charitable receipt. This receipt will counterbalance your final tax return, transforming some or all of the final tax liabilities you have when you die into a charitable gift. A gift of annuity is made when you make a contribution of cash or other property to the Comox Valley Project Watershed Society in exchange for a guaranteed lifetime income (or for a stated interval of time). It is an agreement or contract between you and the Comox Valley Project Watershed Society. Upon death, the Comox Valley Project Watershed Society would receive the remainder of the original contribution. Depending on the time elapsed the Comox Valley Project Watershed Society may get more or less than the original contribution. If an annuity is started when you are between the ages of 75-90 you can receive tax free income. If an annuity is started when you are between the ages of 65-74 you can receive partially tax free income. Where the income is totally tax free, you will receive a donation receipt equalling the initial amount of your contribution minus your expected annuity income. A gift of trust is made when you make the Comox Valley Project Watershed Society the secondary beneficiary to an irrevocable trust. The primary beneficiary (or the income beneficiary) includes you, and if applicable, your spouse. Throughout your lifetime or for a stated period of time you will receive a predetermined amount of the trust; upon your death the Comox Valley Project Watershed Society will receive the remainder of the trust. A gift of residual interest is made when you decide to give the property in which you reside or any other property (art, valuables etc.) 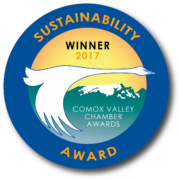 to the Comox Valley Project Watershed Society. You can continue to use and enjoy the property throughout your lifetime. You will receive a charitable tax receipt for the present value of the property when the gift is made. Upon your death, the Comox Valley Project Watershed Society receives the deed of the property. A gift of real estate is made when you leave property, buildings, land, or a place of residence that you own to the Comox Valley Project Watershed Society. This type of gift can be given immediately or specified in your will. You will receive a charitable tax receipt to be used in your final income tax return. A gift to honour someone is any type of gift given to honour a close friend, family member, or a person for whom you have great respect. Perhaps the person was involved with or admired the work of the Comox Valley Project Watershed Society and you would like to leave a gift in their memory. This type of gift ensures that their legacy is always remembered through the work of Comox Valley Project Watershed Society. This type of gift is usually given to mark a special occasion such as a birthday, or anniversary. It could also mark other occasions like Christmas, Mothers/Father’s Day, and Easter, etc. Perhaps there is a particular day which you would like to celebrate, or plan a gift. Planning a gift on a special day can add additional meaning to an already significant time.